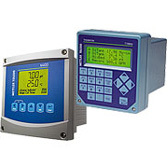 Transmitters are an integral part of on-line measurement systems used to monitor and control industrial processes. METTLER TOLEDO offers a comprehensive range of transmitters for pH, DO, conductivity, resistivity, TOC, dissolved ozone, turbidity, CO2 and flow. A wide range of transmitters meet specific customer needs in many different industries and with highest standards in line with the demands of modern process technology - from basic applications to sophisticated requirements such as HART®-, Profibus®-PA und FOUNDATION Fieldbus communication as well as EEx approvals for installation in hazardous areas.